The site of Ani is a naturally well defended one - a triangular plateau protected on two sides by steep cliffs. Only along its northern edge is there is a considerable stretch of flat, unbroken ground. Although the whole city was encircled by walls, it was along the vulnerable northern side that the most powerful defences were constructed - a line of massive double walls dating from the reign of King Sembat (977-989). 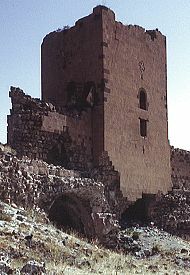 Prior to this, the city walls ran across the narrowest point of the site (beside the Minuchihr Mosque) and enclosed an area not much larger than the present citadel. 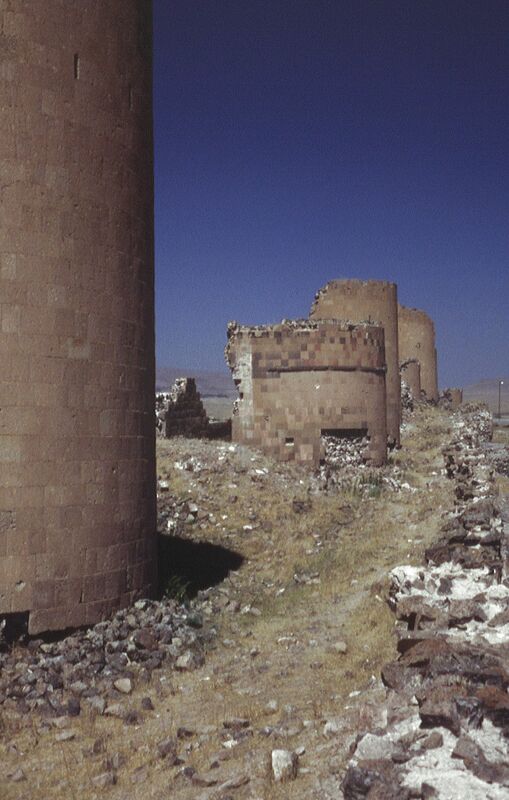 These walls were built by King Ashot III when he transferred his capital from Kars to Ani in 961. Ani grew so quickly that the much longer outer walls were soon needed. The scattering of ruins that extends into the plain suggests that even these new walls did not enclose an area large enough to contain the whole population. 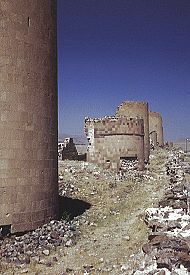 The walls are undoubtedly the most visually impressive part of Ani, and give a unique character to the ruins. The line of double walls was built as a barrier to close the level ground between the ravines of the Akhurian/Arpa river and the Tsaghkotsadzor/Alaca Cay valley. The outer wall is much lower and less well preserved than the inner one, and is preceded by a dry moat. 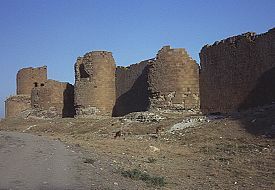 The tall inner wall is pierced by numerous large and closely set semicircular towers, often considerably higher than the wall itself. These have two or sometimes three floors of accommodation within them. The walls are constructed of a rubble concrete core with a thin facing of very exactly cut and jointed beige basalt. Red or black stone was used in some places to decorate the walls with patterns, crosses, heraldic or talismanic animals and symbols, and so on. (Like those used in the border of this page - the first is an ancient European symbol of eternity, related to the swastica and often found on medieval Armenian buildings. 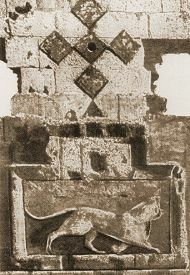 The second is the heraldic arms of the Bagratid rulers of Ani). Gates in the outer and inner walls are staggered. Assailants forcing an outer gate would be met with a solid wall flanked by towers, and confined to the narrow space between the walls, unable to manoeuvre properly or use a battering ram. The basic layout of the double walls is from the 10th century, but they were substantially strengthened over the following centuries. 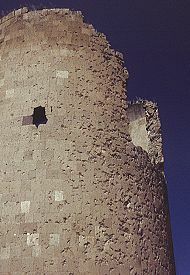 Walls were thickened by adding additional masonry facings - in some places four different faces are revealed by subsequent damage (like the layers of an onion). Within several towers earlier crenellations are ‘fossilised’ within later masonry, showing that the towers as originally built rose to less than half their present height. 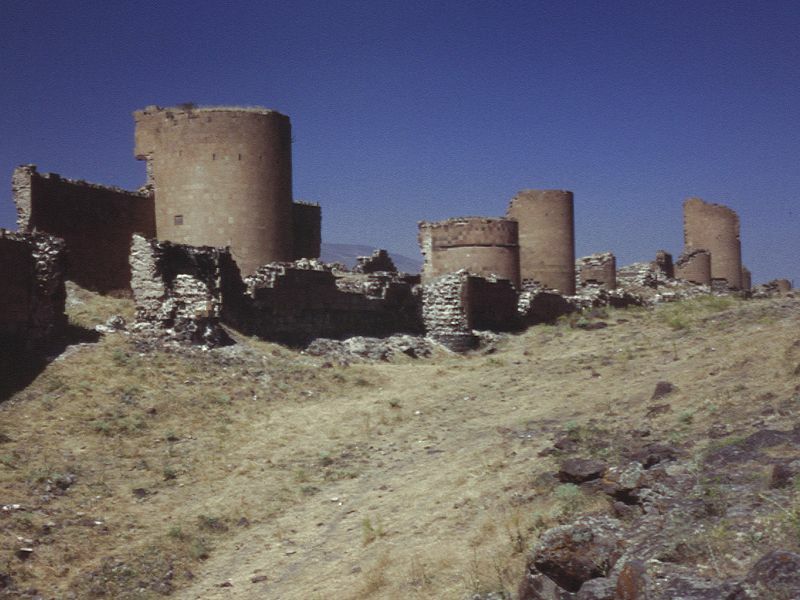 Armenian inscriptions from the 12th and 13th century show that some of these towers were paid for by private individuals. There were three main gates in the double walls. 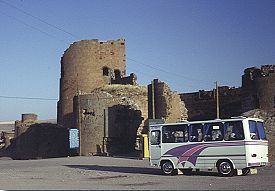 They are known as (facing the walls and going left to right) the "Chequerboard Gate" the "Lion Gate", and the "Kars Gate". 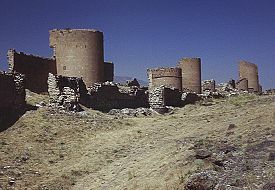 Structure: Marr-Orbeli gate V; towers 30 and 32. The "Lion Gate" takes its name from a large bas-relief of a lion set in the wall nearby, (it is said that at one time a fountain flowed from its mouth). 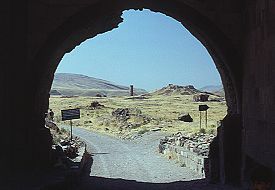 This was probably the main entrance to Ani. From here a street ran through the centre of the city, up to the base of the citadel. The gate was protected by twin towers - the right hand one is now heavily damaged but the left hand tower survives almost to its original height. 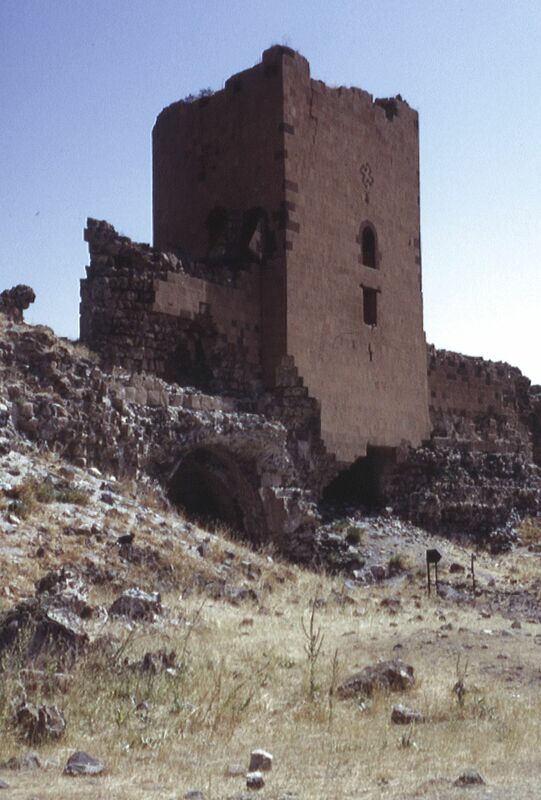 The Lion Gate and a large section of the adjoining towers and walls were badly damaged in an appalling and amateurish reconstruction organised by the Turkish Ministry of Culture during 1996/1997: see here for more details. with the marks of 1000s of arrowheads! 7. 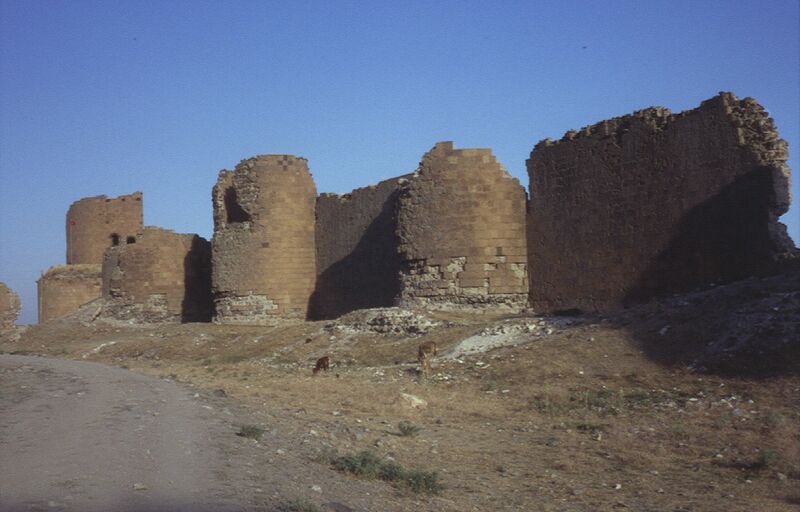 The Lion Gate, before the 1996 "restorations"
This page [Ani's defensive walls] wwas first published in 1999. It was last modified on the 4th April 2000.